I know I’m going to cop some heat for this one but I don’t care. 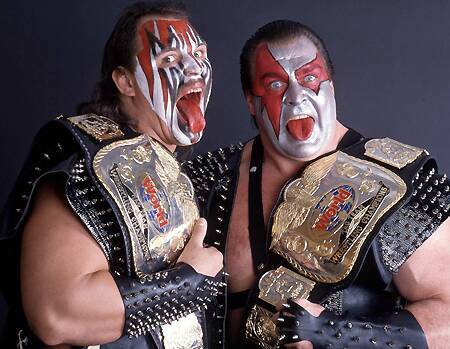 How can they be knock-off Road Warriors if they’re way cooler than Animal and Hawk anyway? WWF’s answer to the Legion of Doom were an iconic act that were the complete 80s cartoon wrestling package: sporting terrifying costumes and face paint and entering to a trademark theme song that is easily top 5 of all time (go on, sing it: pain and destruction…), they carried out double team manoeuvres with gusto, quickly proving too cool to be heels and slotting comfortably into the baby-face role against an array of challengers (check out the pop they garnered after three-peating as Tag Champs at WrestleMania 6: their popularity was comparable to the top single stars of their day). The act lost momentum when Crush made the duo a three-man squad but a belter of a 2 out of 3 falls match at SummerSlam 1990 was a fitting final title defence. Biscuits and gravy doesn’t have the same ring as pain and destruction does it? And the hillbilly attire isn’t as eye catching as black leather and hockey masks. As for Festus going postal when the bell rings…some might have found that a cute touch but I recall CM Punk saying Festus was pilled off his nut during this period and it took the best efforts of the Straight Edge Society to save him. So that means that the gimmick in question was that of a generic hillbilly and his drugged up monster mate who gets triggered by the ring bell and has no control over his actions. I bet they wished they could have just been pig farmers. Honourable mentions: The New Rockers, The Godwinns. Nothing else in tag team lore comes close to matching this angle, one of the Fed’s greatest ever. In early 1992, on the set of the Barbershop, Shawn Michaels followed weeks of dissension by attacking his partner, striking with a super kick before smashing the hapless Jannetty through a mirror. Adding insult to injury, Michaels spitefully tore up a poster of a team, like a distressed Take That fan on the day she found out Robbie quit the band. The attack, so vicious and violent for that era (the mirror bit, not the poster bit), firmly established the face and heel divide and generated such heat that the feud, which was postponed for over a year while Marty navigated one of his regular spells in wrestling limbo, was re-ignited with ease on Jannetty’s return. They had a couple of classic matches in ’93 so while the pay-off may have been delayed, it was certainly delivered. So effective was the splintering of this team that it entered the lexicon of the business: when a team breaks up, fans now try to predict who will be the Shawn Michaels and who will be the Marty Jannetty of the team. As good as the team was together, it will always be remembered for splitting apart. I’m not sure how many people reading this remember the Smoking Gunns or at least do so with any affection. They were always knocking about at the top of the tag division and for what it’s worth my non-fan Dad once caught one of their matches and deemed them “better than the usual lot” (regular readers will know that is praise indeed). However, their run came during the tag division’s lowest ebb: between 1995 and 1996, the whole division essentially consisted of cowboys, farmers and fitness gurus trying to hook up with Sunny. Given such context, when the time did come to split the Gunns up, the expectations weren’t exactly sky high and yet, due to their dominance of said division, one might expect some attempt to end the run in a meaningful way, setting them up for future success. Well, one would be wrong: despite exceedingly low expectations, fans still ended up coming away feeling disappointed. The kayfabe brothers supposedly sacrificed their blood bond in the wake of an upset Sunny abandoning the team and the upshot was a one on one match on Raw. The fairly mundane bout ended with an injury to Billy and both vanished from television, leaving the angle in limbo. When both returned, they went in entirely different directions (hello, Rockabilly) leaving this quasi-feud as the ultimate damp squib in tag-team bust-ups. Honourable mention: The Prime Time Players (I can’t even remember why they split and in no way can I be arsed to google it). My first pick here was TLC at Wrestlemania 17 but whilst that match is great, with its spots and its run-ins and its carnage, it doesn’t exemplify classic tag team wrestling. However, this bout from October 2002, the finals of a tag team tournament was superb. The tournament, which featured such makeshift teams as Billy Kidman & John Cena and Mark Henry & Rikishi, was all about shoehorning solo stars into tag spots, but here it worked perfectly. From the fast paced energy of Rey and Edge to the clinical, crisp savagery of Benoit and Angle, these teams felt like they belonged and while this match didn’t have some of the classic duo spots, it served as a reminder that in the art of tag wrestling still had value in the modern age. Honourable mentions: The Hart Foundation vs The Brainbusters (Summerslam 1989); The Hart Foundation vs Demolition (Summerslam 1990); TLC 1 and 2 (Summerslam 2000 and Wrestlemania 17). This remains the most boring match I’ve ever seen. Say what you want about the pig farmers and the cowardly mounties, at least they weren’t dull. But by this point, the teams had decided to get serious, ditched their colourful togs and slowly, very slowly tussled for no good reason at all. I stayed up to watch this show live on Sky Sports: getting through this match in the early hours of the morning remains one of my greatest every challenges. You might be able to find a sloppier match than this but I doubt you’ll find one with less reason for existing. My inner child loves Demolition and the patriot in is screaming British Bulldogs but the GOATs of this division are Edge and Christian. As two of the trio known as the Brood they were kind of cool but once they cut loose from Gangrel, they hit another level. Their matches against the Hardy Boyz are the stuff of legend but had they merely contented themselves with spectacular bumps off of ladders, their act wouldn’t have eventually stagnated (see RVD whose spectacular offence was never complimented by engrossing character work). Instead, they strived for more and after lifting the titles at Mania 16, they confronted the reality that their opponents were getting the bigger pops: out went the bland baby-face routine, in came the smug, smarmy comedy heel act. 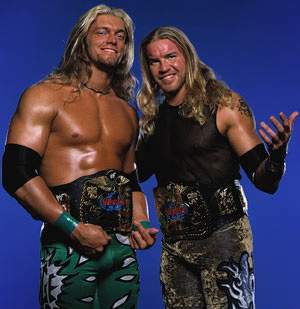 From the 5 second poses to their inside references on guest commentary, they became that rarity in wrestling: a comedy act that was a) actually funny and b) able to turn on the heat when necessary (see their promo at Fully Loaded 2000 when they baited the Dallas crowd with some close to the bone remarks). The natural progression to the Mania 16 ladder war was the birth of TLC at Summerslam 2000; this itself was followed by the near perfect match at Wrestlemania 17 which cemented the legacy of E and C. Indeed, it was fitting that they won all three matches between this iconic trio: the Dudleyz and Hardyz were great but Edge and Christian were that bit better. 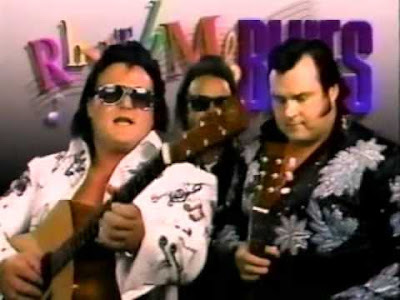 The Honky Tonk Man was a great act: very 80s, very kitsch and great fun. From 1987 to 1989, this guy was golden: he could pop a crowd, draw a house and he deserved that long IC title reign. When his heat started to cool, I get why they thought let’s try and get more out of this guy: put him in a tag team and let’s see what we’ve got. With the right partner, it may have recaptured the magic. But why the hell did they think Greg Valentine was the guy? True, Valentine, a grizzled vet and respected worker, could dance to the tag team tune: he was a former champion, reigning with Brutus Beefcake. But theirs was a team presented as serious heels; even Brutus played it as a tough guy here for fear of undermining the reputation of Valentine. Now Valentine made Bruti look like Brock Lesnar: here he was forced to strut and sing in a ridiculous get-up before a bemused Honky and an uncomfortable audience, all the while getting laughed at by whomever was on commentary.